Talking 'Bronze Age Boogie' with AHOY's Stuart Moore – AiPT! Writer Stuart Moore talks one of the most promising titles of AHOY’s spring lineup. Following the announcement that new startup publisher AHOY Comics will launch its second wave of titles in spring, AiPT! 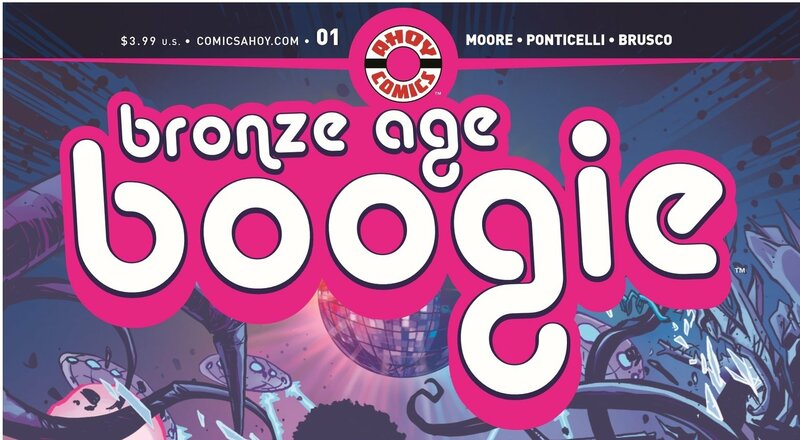 was lucky enough to have Captain Ginger writer Stuart Moore sit down with us to talk about his new AHOY series, Bronze Age Boogie. AiPT: What is it about the ’70s that led you to the idea of combining all the most popular comic genres of the decade? SM: I’m a child of the ’70s. I grew up with TV cop shows, grindhouse movies, and those wonderful crazy black-and-white comics magazines that had much more freedom than the Code-approved color books. Those magazines were filled with extra features, articles, and text stories…just like the AHOY books. So I started making notes on things I liked from that period: kung fu, barbarians, talking apes, that sort of thing. And a story just kind of formed itself, an epic about a Martian invasion that can only be defeated by a haphazard group of time travelers. It’s almost like a classic team book, except that the team members all come from different genres! AiPT: We’ve have had a great first look at some of the character designs for the series. Could you tell us anything about the characters? SM: The main character is a teenage barbarian named Brita, the daughter of a barbarian king. She’s tough and smart and a good swordsman, but she has a feeling she doesn’t belong in her time. And yet she seems to have a destiny there, too. Brita snuck up on me; I thought she’d be a supporting character, but she wound up taking over the book, at the beginning anyway. I don’t want to say too much about the others yet. The time-traveling apes are crucial; they’re the link that holds everything together. There’s an intricate plot involving the Martians, too, and that leads directly back to one of the other main characters. I have to say I was SO LUCKY to snag Alberto Ponticelli as co-creator/artist. He can draw anything; his Martian tripods are classic but modern, very kinetic and dangerous-looking. And I couldn’t believe it when he told me he was a martial arts teacher! That really helped bring some scenes to life, especially in issues #2-3. AiPT: If you had to pick just one comic book genre, which would be your favourite? SM: I’m a science fiction guy, through and through. I’m not leaning into that too hard here, because I just did Captain Ginger at AHOY. But Boogie does feature Martians and time travel, so I guess I can’t help myself. AiPT: AHOY tells readers to “expect more” but with “apes, monsters, Kung Fu, sword-and-sorcery, and cosmic adventure” how much more can readers expect? SM: We’ve got a four-part back feature that we’ll be announcing soon. I can’t say the title or announce the creative team but I can say that it is set in 1958 and about the first bear in space. It’s fun and twisty and should keep people guessing. And yes, there will be text stories too.